A recent Red Heart email featured that company’s Best Guy Sweater Ornament, a cute little striped sweater that’s perfect for the tree or a gift bag. Which reminded me of my Christmas Vest Ornament (I would swear I’ve knit one with arms, but there’s no pattern I can find so I must not have), which sent me on a hunt for more adorable sweaters you can knit for your tree. Enjoy. I love this little sweater with needlefelted tree on it, from Natural Suburbia. She used handspun for hers, too, which would add another nice layer of homemadeness. Lion Brand makes a garland out of adorable tiny sweaters that spell out the word NOEL, though of course you could make as many as you want to spell whatever word you like. Knit and Make has a set of three cute little jumpers: one plain, one cabled and one with a snowflake motif. And the Ravelry downloads: there’s a sweet top-down mini raglan by Heather Hoefle and the similar Cheers by Cheryl Niamath, either of which would be a great way to learn this technique if you’ve never tried it before; Anne Ross’ mini sweater ornament, which adds a touch of embroidery to the front; and the Bitsy Sweater by Daphne Puerto, which has been used to make lots of adorable variations. 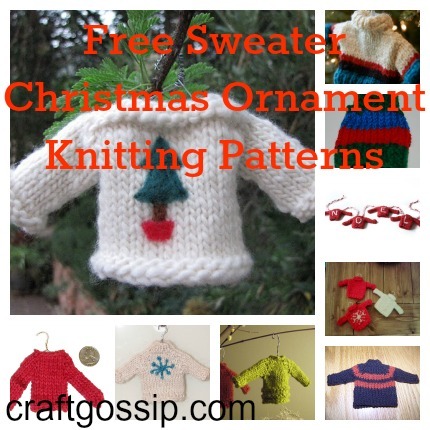 I hope these patterns inspire you to put a little knitting on your tree! These are so adorable! Thanks for posting all these links! I have seen a couple of these patterns, but not all. Thank you so much for sharing the links! Thank you for all these links. They are gorgeous. Can start preparing for next Christmas.